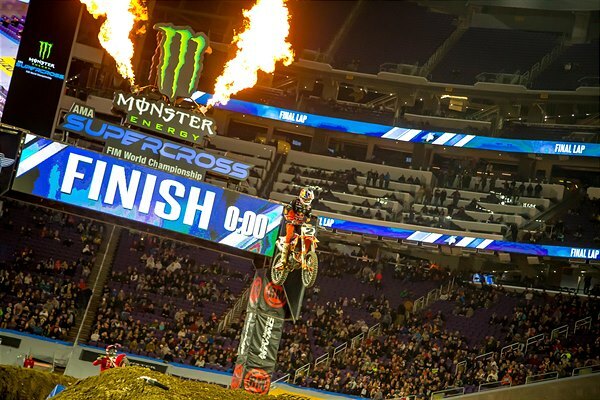 MINNEAPOLIS, Minn. – The AMA Supercross Championship made its way east on Saturday for the first time in 2019 as Round 6 of the 17-race series took place inside U.S. Bank Stadium amidst Minneapolis, Minnesota’s frigid temperatures. 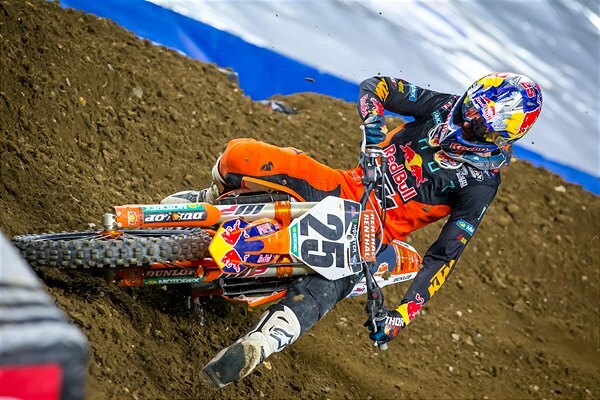 Red Bull KTM Factory Racing’s Cooper Webb made a major statement this evening by becoming the first and only three-time 450SX winner this season as he sits within one-point of the early championship lead. 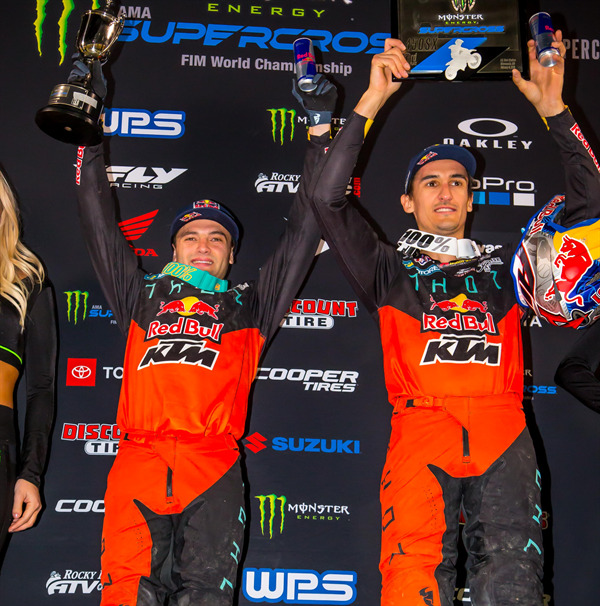 His teammate, Marvin Musquin, battled to his fourth-consecutive podium appearance with a third-place finish in the class. 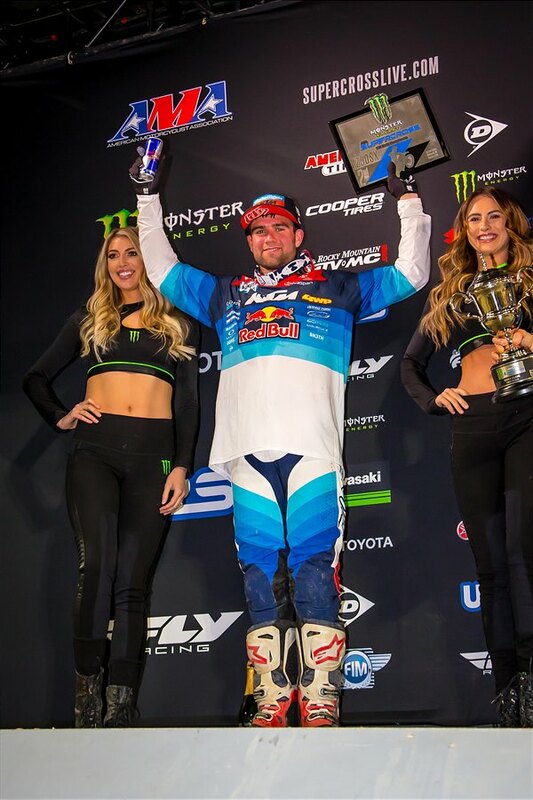 Troy Lee Designs/Red Bull/KTM Factory Racing’s Jordon Smith made a strong season debut for the opening round of the 250SX East division, where he overcame some last-minute chaos to rally his way to a second-place finish in the Main Event. In 450SX Heat 1, Cooper Webb came out blazing aboard his KTM 450 SX-F FACTORY EDITION, as he captured the holeshot and early lead. He held off a hard-charging pack of riders to take the win and the top transfer position into the Main Event. The three-time winner kept the momentum rolling into the Main Event as he seized the holeshot and immediately engaged in a battle for the lead. Sitting in second early on, Webb was eventually joined by two other riders for what turned out to be an intense four-way battle for the race-win. 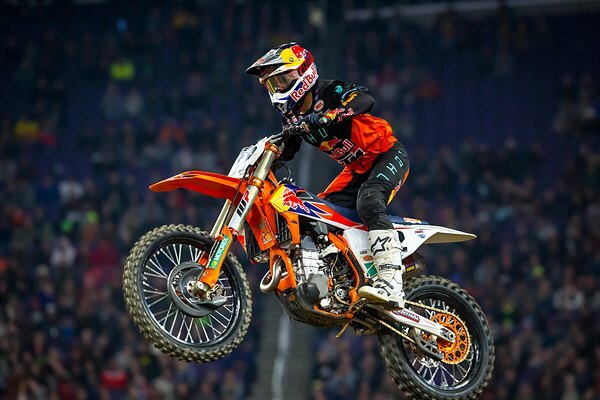 Webb remained patient throughout the first half of the race and he finally pulled the trigger just after the halfway mark to launch himself into the lead. From there, Webb began to pull a small gap over the second-place rider to eventually claim the win by a three-second gap. 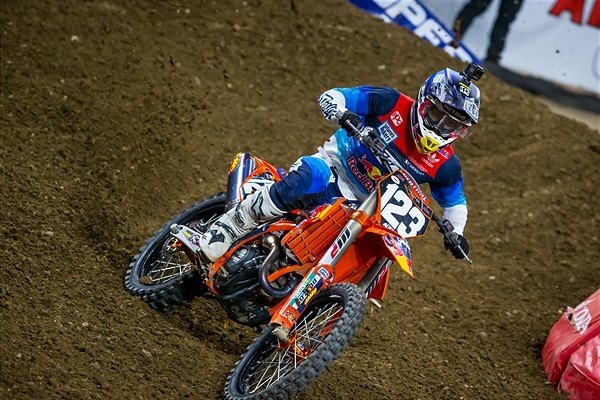 After qualifying third overall, Musquin had a rough start to the evening in 450SX Heat 2. He got off to a good start and immediately put himself into second on lap two, battling for the lead for most of the race. However, a couple of crashes late in the race ultimately took him back to an eighth-place finish. 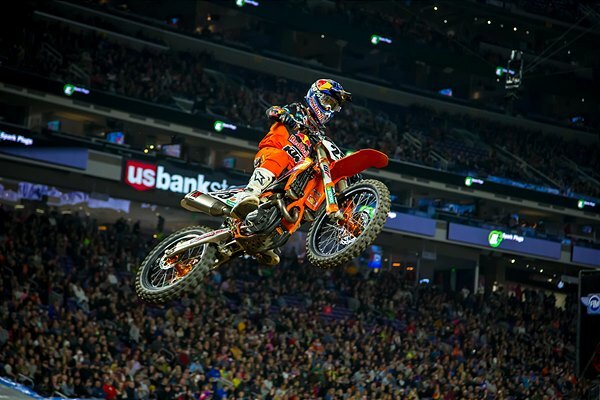 With a 16th place gate pick for the Main Event, Musquin didn’t get the best start as he got pinched off heading into the first turn and he began the opening lap in eighth. 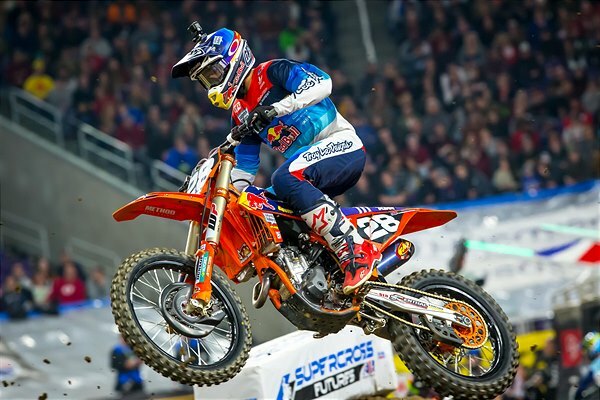 Musquin put his head down and charged through the pack to put himself into a top-five position on lap ten. From there, he fought hard to catch the freight-train ahead and it wasn’t long before he inserted himself into the podium battle. He made the pass for fourth late in the race and with five laps to go he moved into the third-place position, where he ultimately finished for the night. Rocky Mountain ATV/MC – WPS – FLY – KTM’s Blake Baggett ran fourth for a majority of the race before passing his way into third with five laps to go. Unfortunately, while running third, Baggett had a big crash that ended his race early. 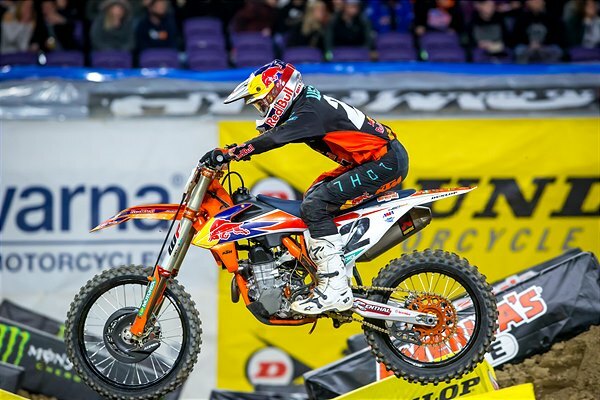 Troy Lee Designs/Red Bull/KTM Factory Racing’s Jordon Smith had a great start to the night as he powered his KTM 250 SX-F to a convincing win in 250SX East Heat 1. In the Main Event, Smith had a one-off incident with a flat tire on the sighting lap, where the Troy Lee Designs/Red Bull/KTM crew quickly replaced the rear wheel just minutes before the gate drop. Smith didn’t seem to be bothered as he pulled a top-five start and climbed his way into second by lap five. He went down on lap seven and dropped back to fourth but he was able to fight his way back to second by the halfway mark. Smith charged after the race-leader to ultimately finish six-seconds back for second-place in the opening round of the 250SX East competition. His teammate, Mitchell Falk, made his AMA Supercross debut on Saturday after racing only one professional AMA Pro Motocross race in 2018. Falk got off to a great start in 250SX East Heat 1, rounding out the top-five with a solid transfer into the Main Event. Falk put his KTM 250 SX-F into 11th place on the opening lap of the main before pushing his way into a top-ten position by lap two. On lap five, Falk went down and dropped outside the top-15 and from there he struggled to make his way through the pack, eventually finishing 17th in his first-ever professional supercross.